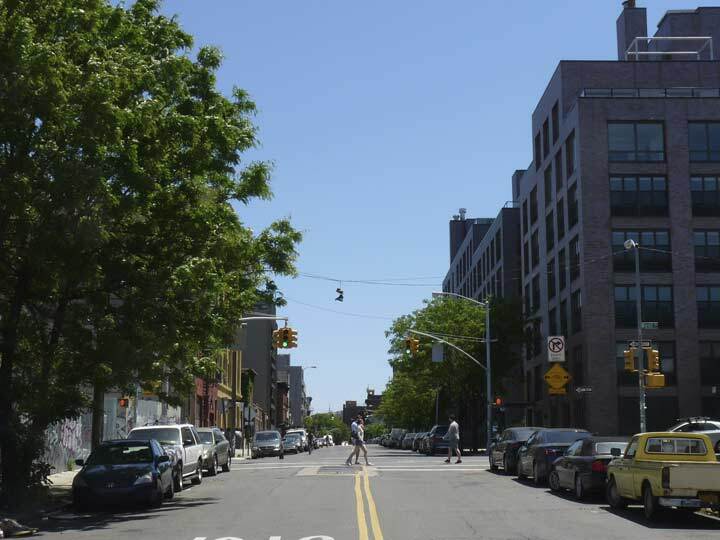 Metropolitan Avenue is one of the lengthiest routes between Brooklyn and Queens. It was first built in 1815, give or take a year, as a toll road and was known along much of its length as the Williamsburg and Jamaica Turnpike until the mid-1800s, when it was bestowed its current name. 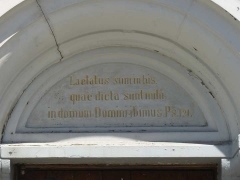 It runs from the East River to Jamaica Avenue and along the way, marks the southern limit of Newtown Creek, and runs through Lutheran/All-Faiths and St. John’s Cemeteries, as well as Forest Park. It’s the spine of several communities — Williamsburg, Middle Village (so named because it was midway between Williamsburg and Jamaica), and Kew Gardens, and forms the boundary line between Ridgewood and Maspeth. I have walked along the full lengths of many roads during the 16 years (as of 2015) spent doing Forgotten New York. I usually make two or three trips or so — it took about ten years before I was able to complete Bedford Avenue from Sheepshead Bay north to Greenpoint! It usually doesn’t take that much time; Richmond Terrace on Staten Island took two separate trips in two or three weeks. I choose the routes I am going to walk full-lengths carefully. The most important thing is, the road has to have a lot of changes — infrastructurally most of all, because that is what I concentrate on, but also the ‘feel’ or atmosphere has to change dramatically along the way. There are a number of lengthy roads in Queens like Francis Lewis Boulevard that are mostly residential; the “Frannie Lou” looks different than its other sections only when it passes through Cunningham Park. 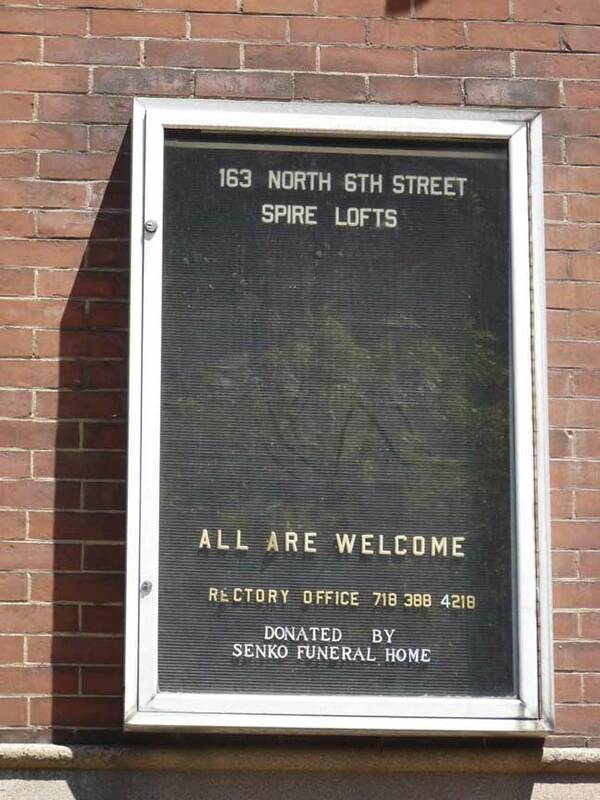 I do not want a “sameness” in the pictures. 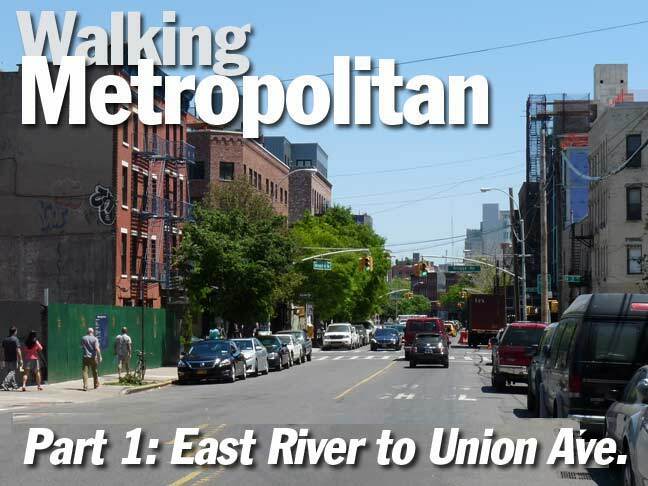 Unlike my other full-length street pages this time, I did it all in one burst and walked the full length of Metropolitan Avenue in one day, taking about eight hours. I am not a speed walker. My legs are short and I take short strides. Little old ladies can get ahead of me. I am also stopping a lot to take pictures. Had I decided to walk more briskly, I suppose I could have shaved an hour or two off. According to the measurement tool on Google Maps, Metropolitan Avenue is about 8.3 miles from the East River to Jamaica Avenue, so I was going one mile an hour. My total mileage on the day was 13 miles. That’s because I had to walk through Williamsburg to get to Metropolitan and then down Jamaica Avenue to get to the Jamaica LIRR station, where I got a train to Woodside and then another one to Little Neck. A bit of background first. 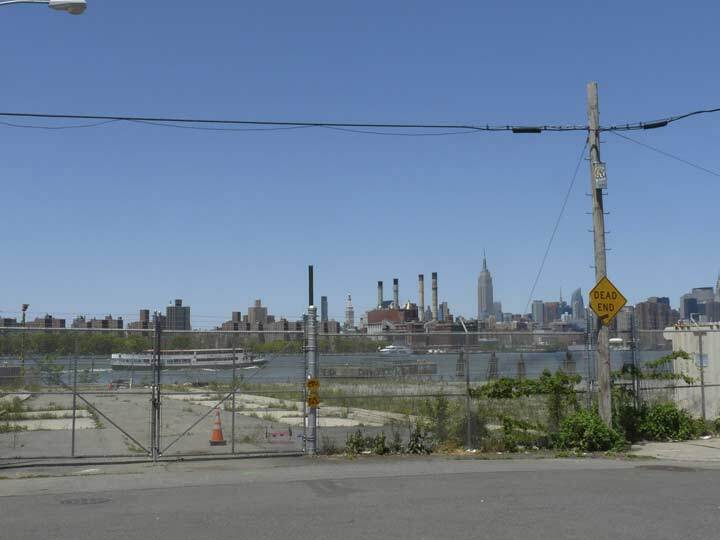 The Williamsburg(h) and Jamaica Turnpike was built out from the Brooklyn-Queens border along Newtown Creek east to Jamaica. 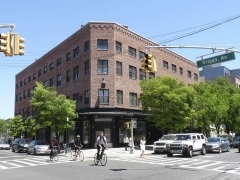 The town of Williamsburg’s streets were laid out in the early 19th Century with North and South numbered streets running east to west, and non-prefixed numbered streets running north and south, with First Street (now Kent Avenue) along the East River, ending with 12th Street, now Hewes. 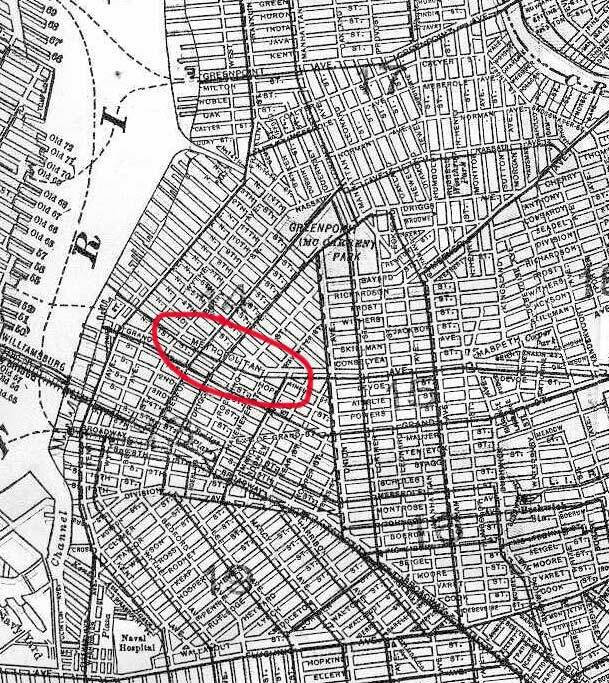 For much of the rest of the 19th Century, North 2nd Street was slotted between North 1st and 3rd, and when the turnpike made a connection with it, the North 2nd Street name remained for a few decades. This excerpt from an 1855 is the oldest one I can find with a reference to “Metropolitan Avenue” and even that was east of what is now Bushwick Avenue. 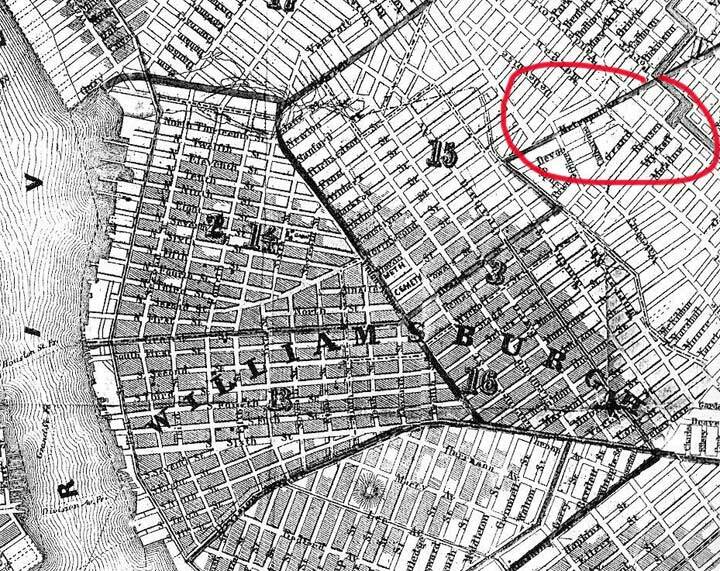 In 1874 the Willliamsburg(h) and Jamaica Turnpike is clearly marked as it runs straight through “East Williamsburgh” or what is now Ridgewood. Note that on this map the north is on the bottom and south is on the top. 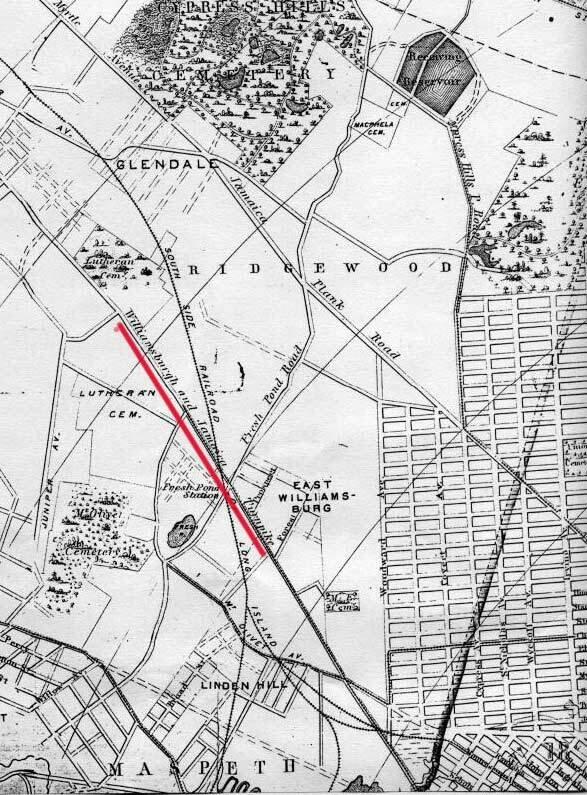 Note the actual “fresh pond” along Fresh Pond Road south of what is now Mount Olivet Crescent. The “Fresh Pond Station” on the LIRR remained in passenger service until 1998! Rand McNally map from 1913. This is the earliest map in my collection that refers to the road as Metropolitan Avenue all the way to the East River. Naming this road “Metropolitan Avenue” must have been seen as an act of hubris, at least when the entire road was given the name. Into the 20th Century it was still running through sections of open country, connecting two towns, Williamsburg (which briefly attained city status before its absorption by Brooklyn in the 1850s) and Jamaica, which didn’t become as huge a railroad hub and shopping mecca as it is now until the 1910s. I wonder whose decision it was to give the road this name. The answer is probably in a rusting drawer somewhere, or an obscure corner of the internet. I got off the L train at the Driggs Avenue end of the Bedford Avenue station. I was immediately vouchsafed the sight of Driggs Avenue’s haunted house at #539. I never fail to take a look at this place whenever I’m around and yes, it is occupied, or was a few years ago, by a fellow named Jim Tarpey, whose story on Vimeo seems to slip in and out of availability. I tend to think of Williamsburg as more a theme park than anything else these days. However as you will see I do like what the influx of restaurants and clubs has done to the local infrastructure scene. 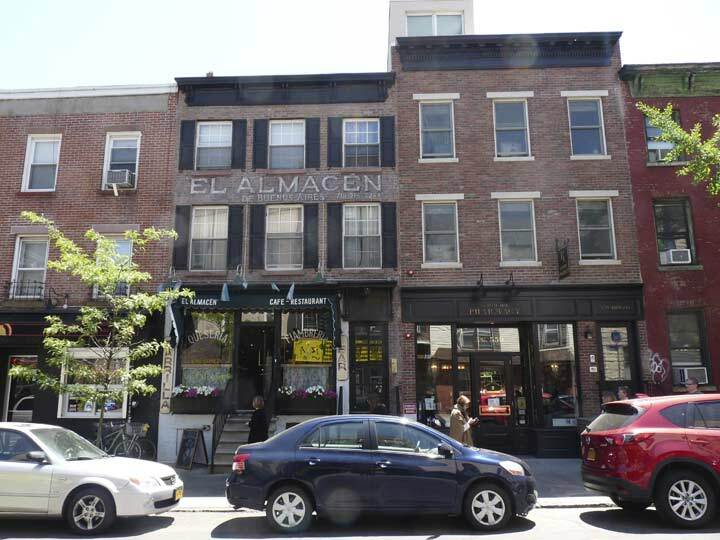 On Driggs Avenue and N. 7th, El Almacen, which offers Argentinian fare, has a painted sign that was made to resemble similar “faded ads” found on buildings from decades ago. 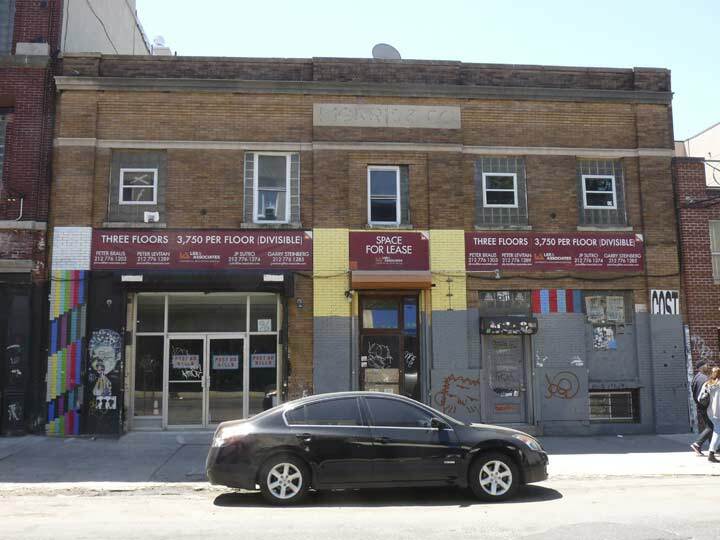 Next door to the left, Crif Dogs, an offshoot of the East Village hotdog palace, invited the Google Street View camera inside. 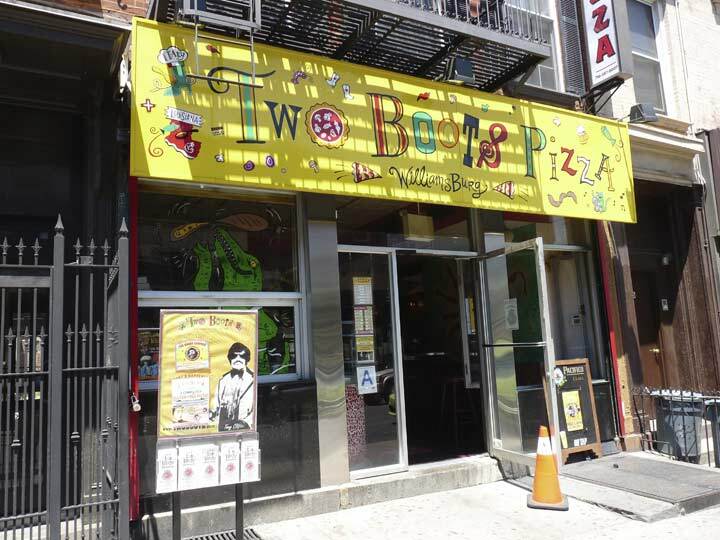 Next door Two Boots Pizza has taken over the space previously occupied by the locally-owned Driggs Pizza. The Two Boots chain originated in 1987 in the East Village and expanded into Park Slope and grew from there, with branches as far afield as Nashville, TN. It offers a different spin on the pizza concept, adding Cajun spices and offerings like shrimp and BBQ chicken on pizza stylings, which are named for idiosyncratic characters like Larry Tate, Darrin’s boss on Bewitched, Tony Clifton, one of Andy Kaufman’s characters, or Newman, the scheming postman from Seinfeld. The signage is used at all branches. Turning west on North 6th Street, this building has been Boricua College since 1974, but before that it was St. Francis Prep High School from 1952 to 1974, where several of my friends attended, all Brooklynites who had to get multiple buses when it moved into a building on Francis Lewis Boulevard and the Long Island Expressway beginning in the fall of 1974, becoming co-ed at that time. When I was in school, Cathedral Prep had a pretty good handball team, but SFP’s was even better: they never lost a game during my high school years. SFP’s alumni include Frank Serpico, Vince Lombardi, Joe Torre and Rutgers head football coach Kyle Flood. Directly across North 6th from Boricua College is the former St. Vincent de Paul Church, also the former St. Ann’s Armenian Catholic Cathedral. 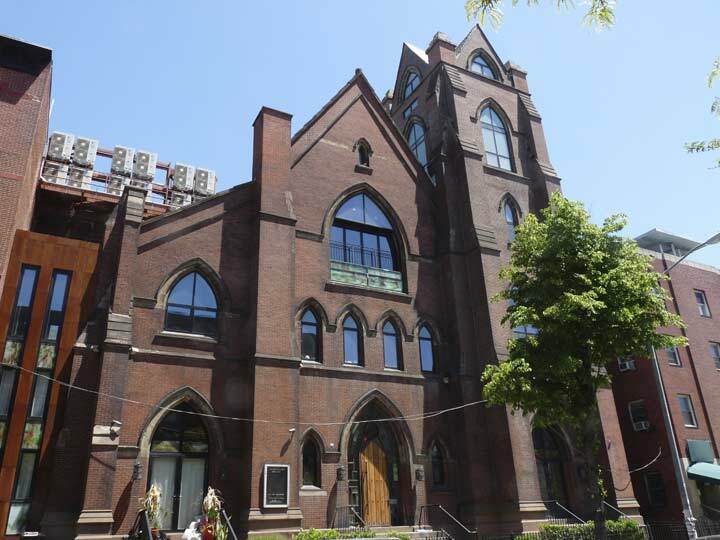 The church was constructed in 1869 and designed by prolific ecclesiastical architect Patrick Keely, but the Brooklyn Diocese closed it in 2005 after the name change; it was purchased by a developer in 2011 and converted to The Spire Lofts in 2013. 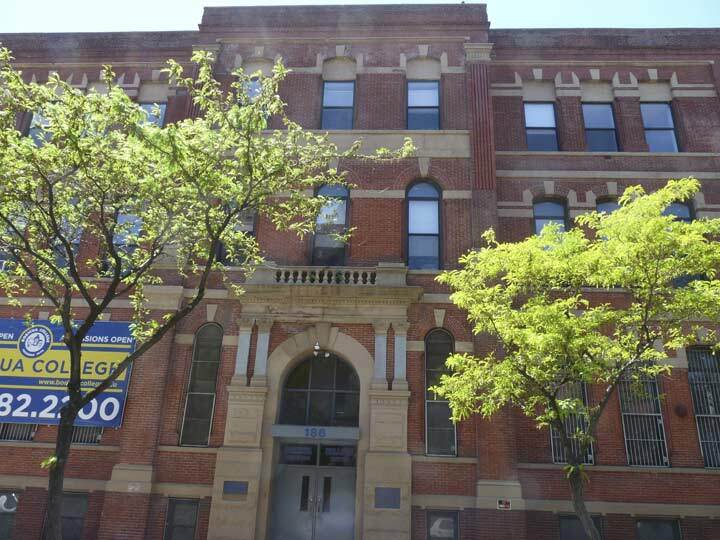 This is nothing new: my high school, Cathedral Prep, closed in 1985 and became condominiums a few years later. The condo has kept the church’s old bulletin board, complete with the rectory office number ( I don’t know if that’s now the building office number). 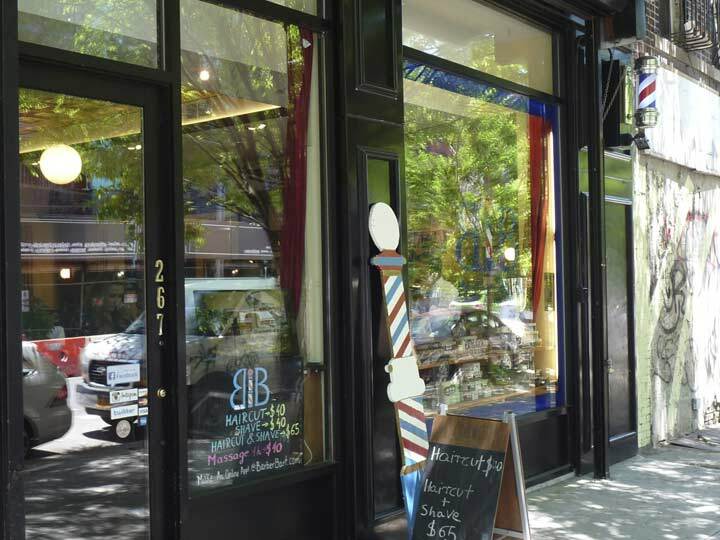 Continuing west along N. 6th, I took in the restaurant and retail signage designs. 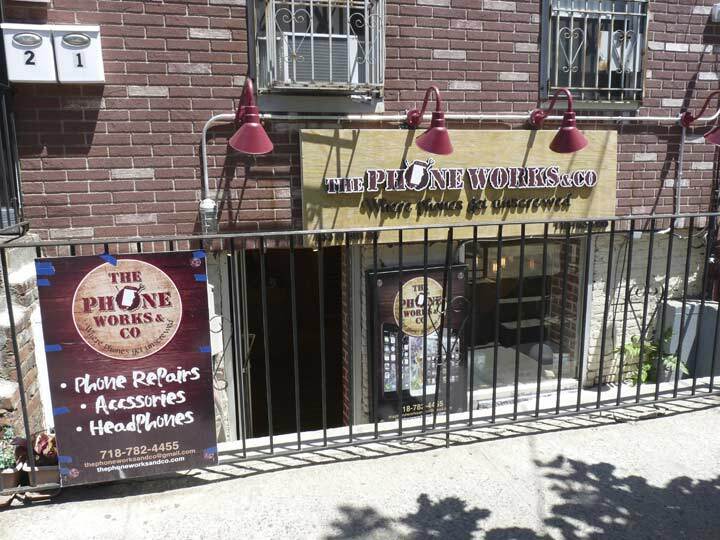 This place repairs cell phones and headphones. They also offer custom cases and ancillary products. 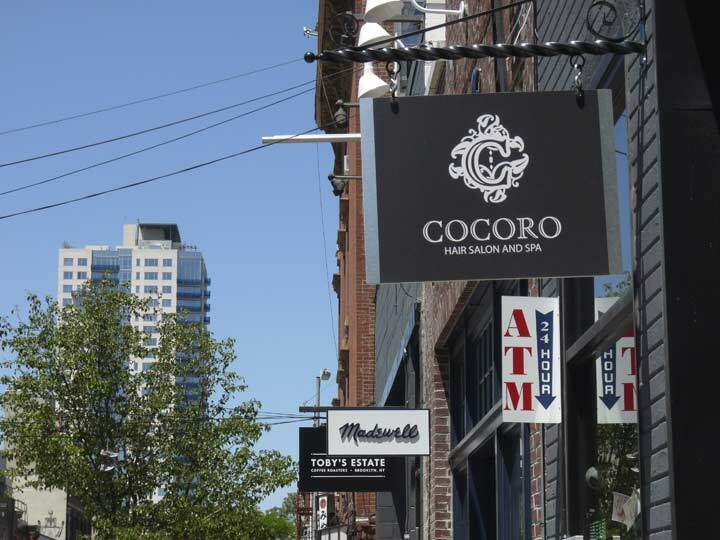 Over the past decade, the shingle sign hanging over the sidewalk has made a big comeback. It makes perfect sense because you can see what stores are on the block as you are approaching them. 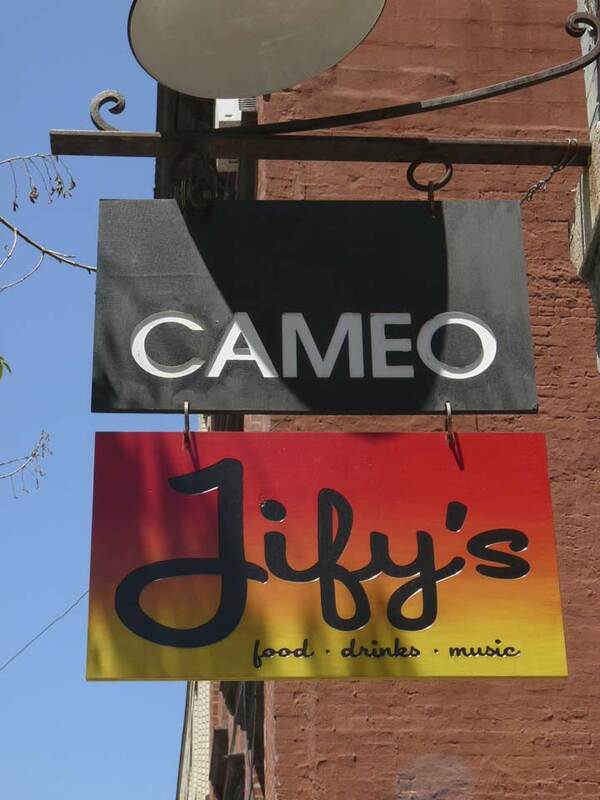 The signs employ all manner of designs, colors and typography. Even on North 6th, the center of town, the old Willieburg sometimes peeps through, as we will see. 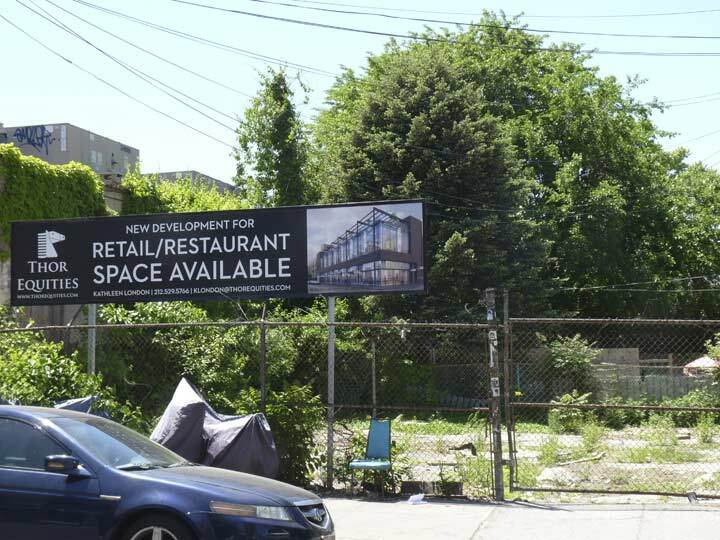 This lot has been empty for several years, while Thor Equities illustrates what they have in mind for the space. 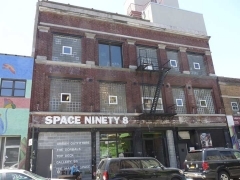 What appears to be a factory or warehouse space on Berry Street and N. 6th was occupied in May 2015 by a business called Gant Rugger, which sounds like a sporting goods store but is actually a haberdasher that has what they call a “tasting table.” A clothing line inspired by what several Brooklyn chefs wear, along with samples of the food they make. It’s Williamsburg. 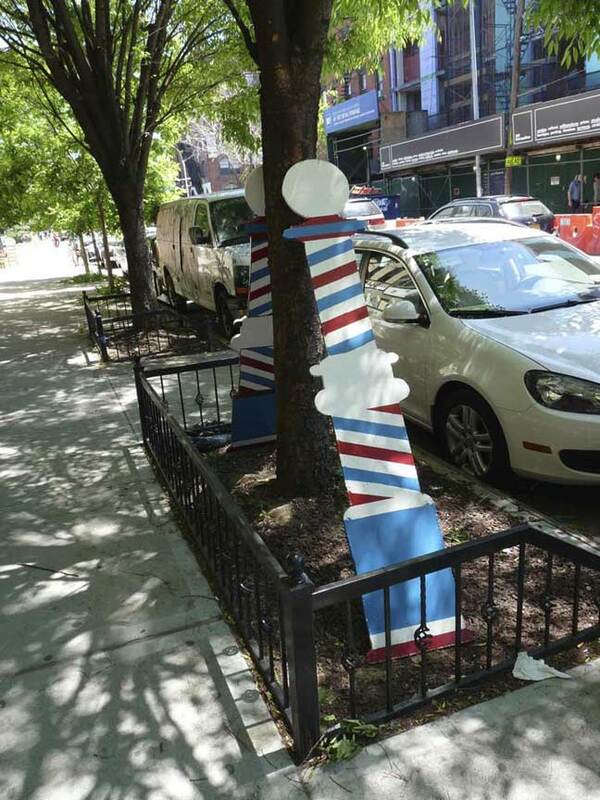 On Rivington Street there’s a combination clothing store and barber. Me, I gotta go to Mo’s. 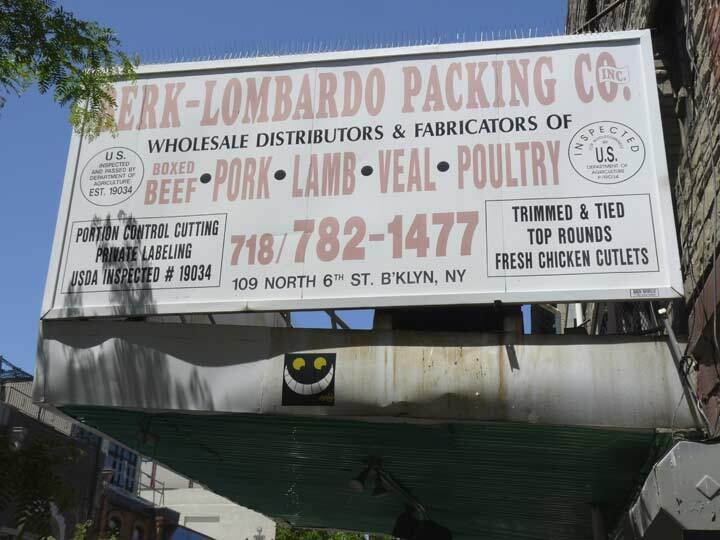 Between Berry and Wythe is the Berk-Lombardo Packing Co., a definite throwback. 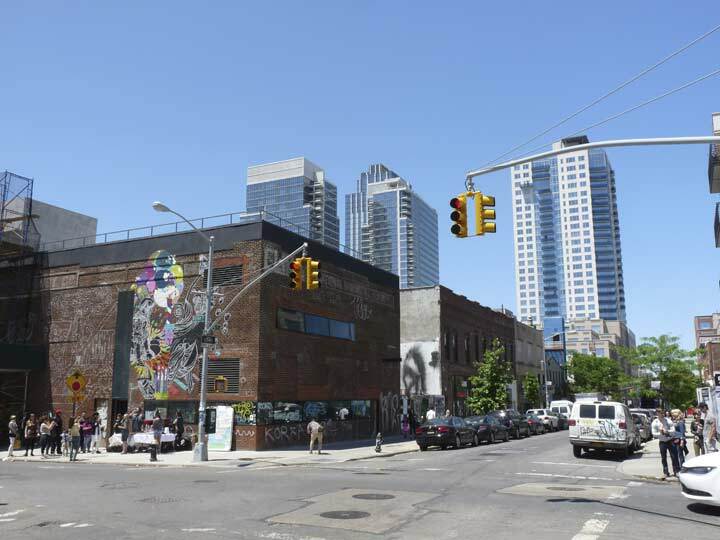 Williamsburg never had the same amount of meatpacking concerns that the area around the old Gansevoort Market in the West Village had, but you have to give this place points for hanging tough against the Twee Onslaught. Shoehorned in between meat wholesalers and faced across N. 6th by fashion boutiques and an American Apparel shop is Sweetwater Restaurant, which sports and old-fashioned exterior. Now billing itself an “American bistro” it was apparently a dive bar in the recent past. 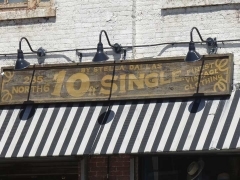 #105 has a long history selling spirits as the restaurant’s online menu reveals on its cover page. The joint’s patterned tile floor is also represented there. 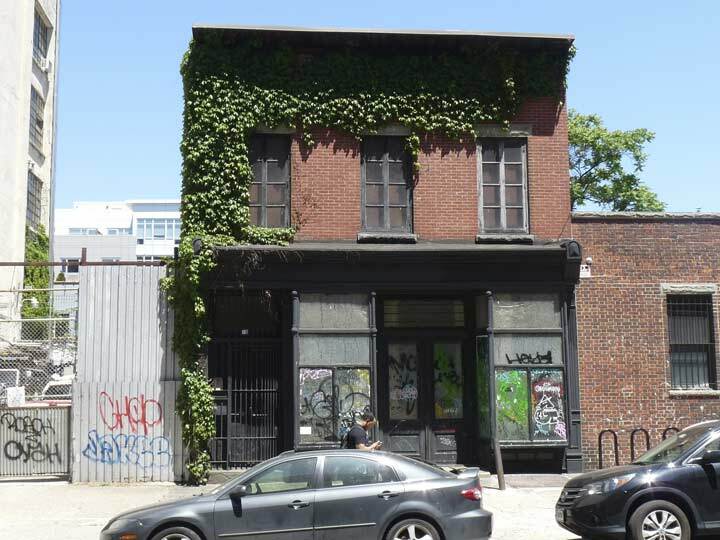 A couple of examples of building repurposing in Williamsburg. These used to be warehouses or factories but have been adapted for retail. The second building’s “Morris & Co.” tablet at the roofline has been removed but you can still make it out. It used to be home to Academy Records. The North Six apartment towers on Kent Avenue tower over Wythe Avenue at North Sixth. 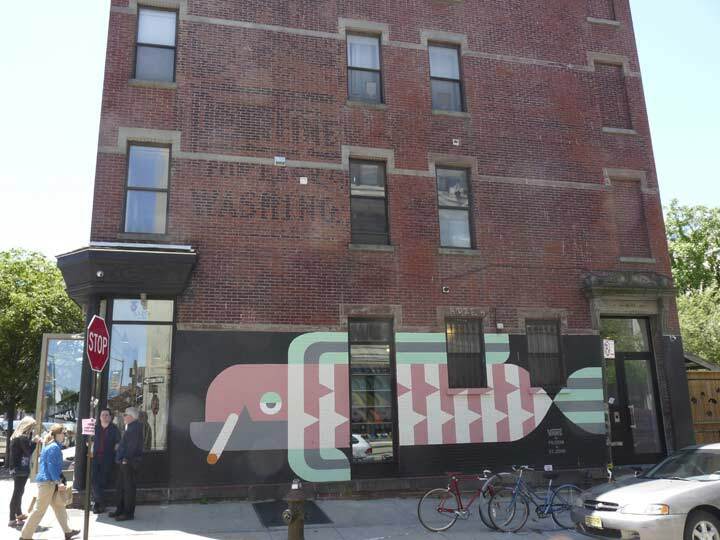 Wythe Avenue, according to the NY Times in 2012, had found its moment with a collection of trendy hotels (notably the Wythe Hotel at North 11th), watering holes and even (upscale) bowling alleys. 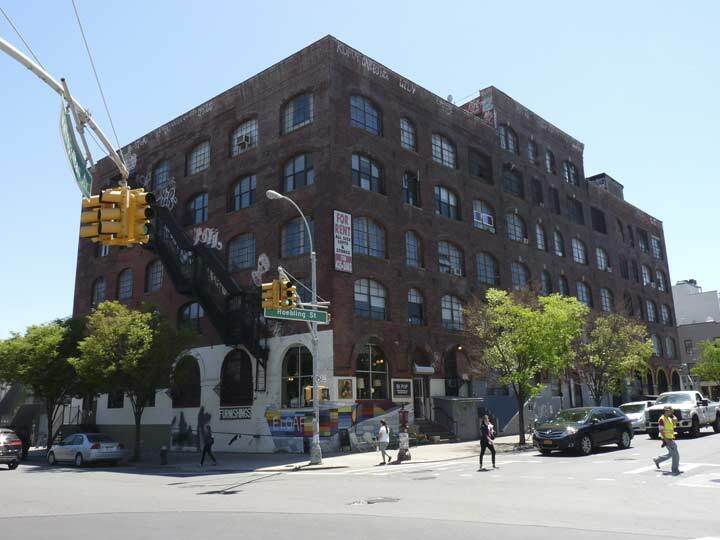 Many of the new action has sprung up in ancient brick buildings that, as mentioned before, were used for industrial purposes when Brooklyn worked, or were abandoned. 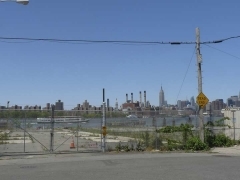 The money came from a rezoning in 2005 pushed through by then-Mayor Michael Bloomberg and the City Council that allowed for the riverside towers to be initiated, and Manhattan-style nightlife followed the new money. 50 North 5th Street, on Wythe between N. 4th and N. 5th Streets. I don’t mind the look, since I like brick buildings. 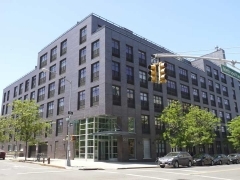 Lofty levels of income are requited here; Curbed.com says the building’s perks are a two-level fitness center, pet spa, indoor basketball court, waterfall-equipped courtyard, bocce ball courts, landscaped roof deck with outdoor showers, and two lounges, one for work, the other for play. 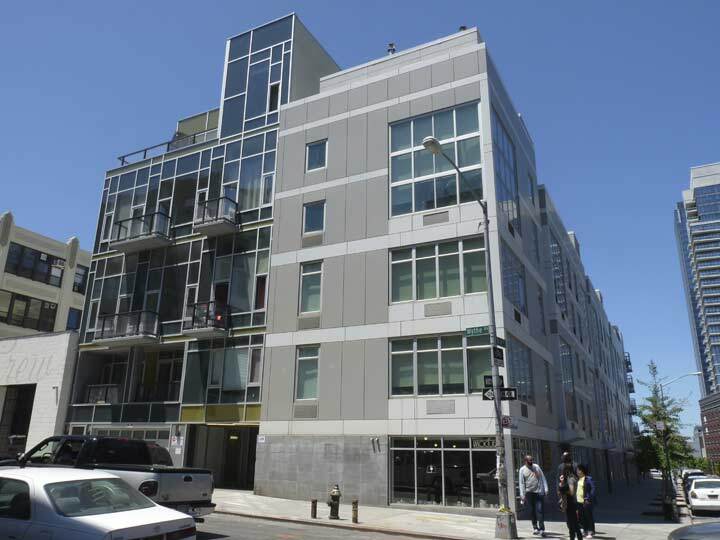 In any case, better than this new pair also on Wythe and North 4th Street; the trend is for a polished metal exterior. Hope these places don’t bake in the hot sun. 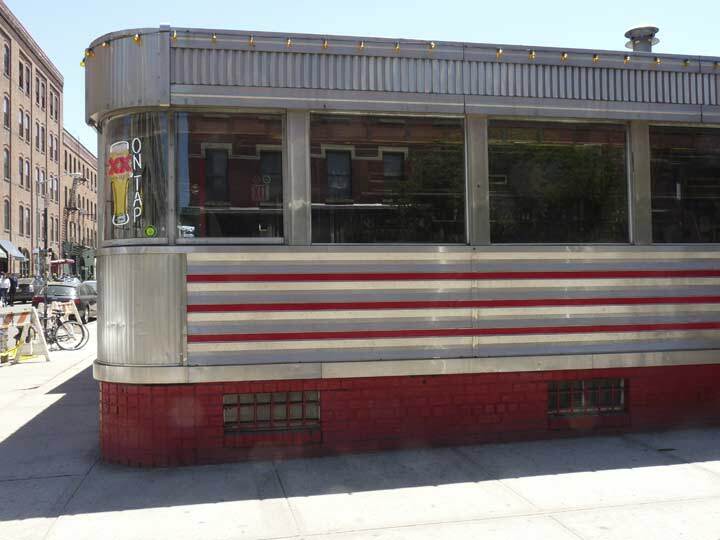 The apartment-ization of Wythe Avenue is about to claim this classic 1953 Mountain View diner at Wythe and North 3rd Street. 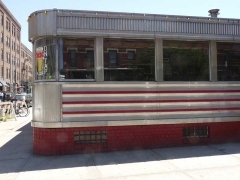 As the Wythe Diner, it had served dock and railroad workers through its first few decades, and then as the Relish with an updated, more expensive menu for the artsy types that filtered into Williamsburg beginning in the 1990s, and finally as a branch of the La Esquina upscale Mexican restaurant in NoHo. 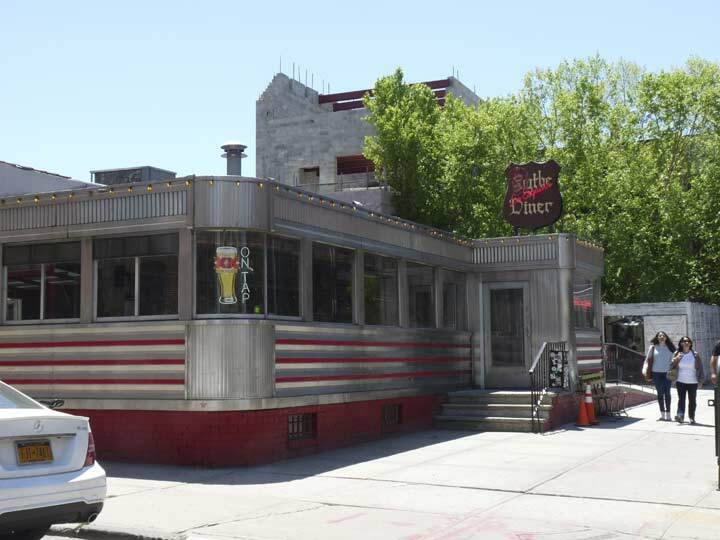 A developer plans to build a 6-story mixed-use building where the diner stands, but perhaps it can be moved elsewhere. 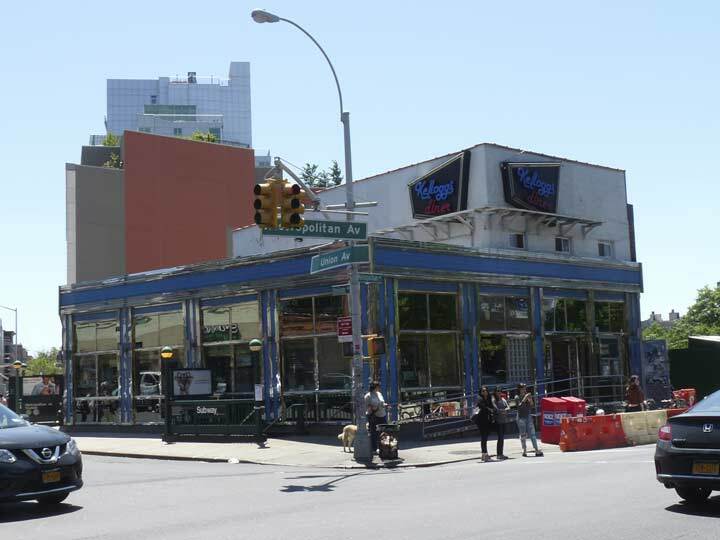 Other diners in the area include(d) the now-closed Miss Williamsburg on Kent Avenue and Metropolitan, the diner simply called “Diner” at Broadway and Berry Street, and the recently-renovated Kellogg (I’ll discuss it later when I get to it on Met Avenue and Union Avenue). 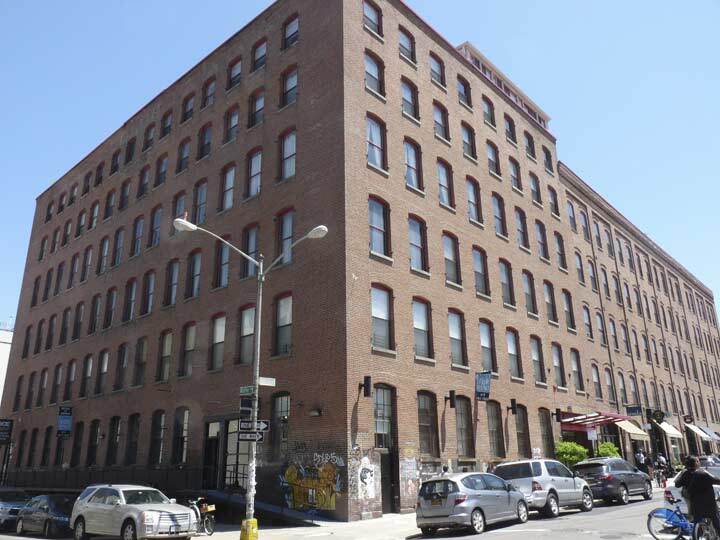 A pair of gargantuan loft builings, probably also used as factories at one time, can be found on Wythe and North 3rd. Without Landmark status, information on such buildings is sketchy. 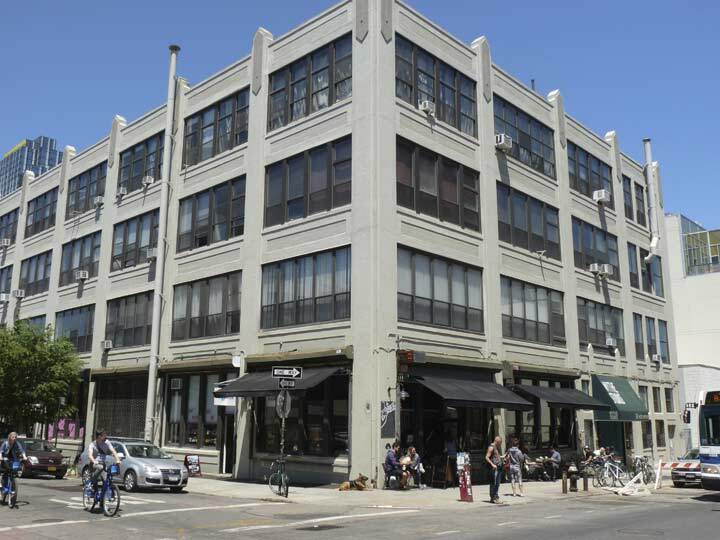 The top floors are residences, while various businesses are found on Wyth and North 3rd, including Brooklyn Oenology (which means the study of wine). 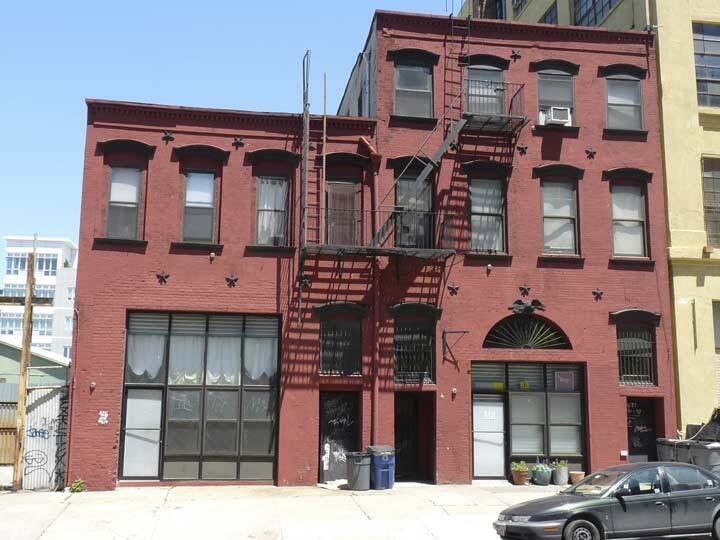 This is another huge loft building, #242 Wythe, on the opposite side of the street, also mixed-use. The construction reminds me of the various Robert Gair former cardboard and paper products factories in DUMBO. 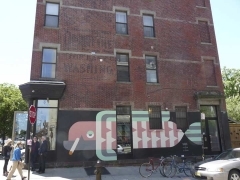 James Pyle made soap at 350 Washington St. in Manhattan in the 1860s. The product was sold in grocery stores as Pyle’s O.K. Soap. 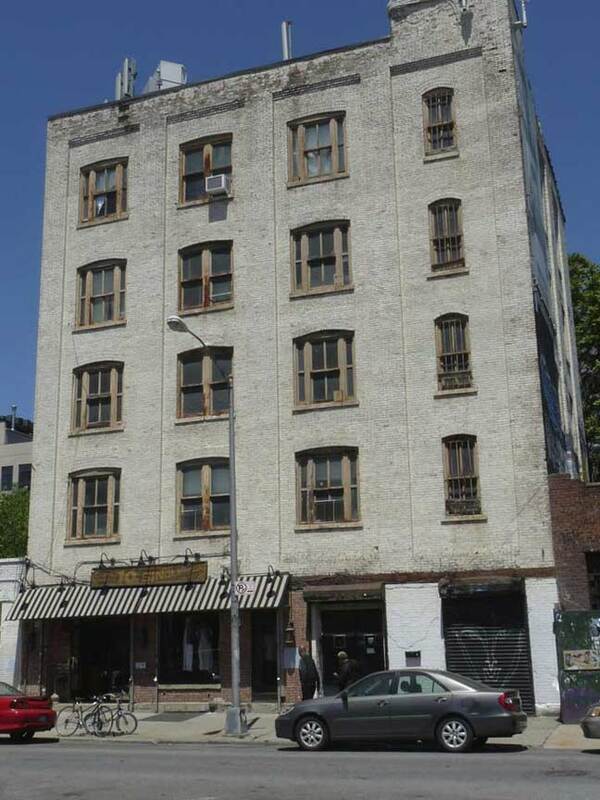 He later moved the factory to 414 Washington St. and sold Pearline Soap in one-pound packages at 15 cents per package. It was a coarse white powder formulated with sodium carbonate for washing clothes. Much more faded is a notice at the top of the wall for Meyer Ship Supplies, but that’s almost undetectable now… so much so that I didn’t see it, and cropped it out of my shot. 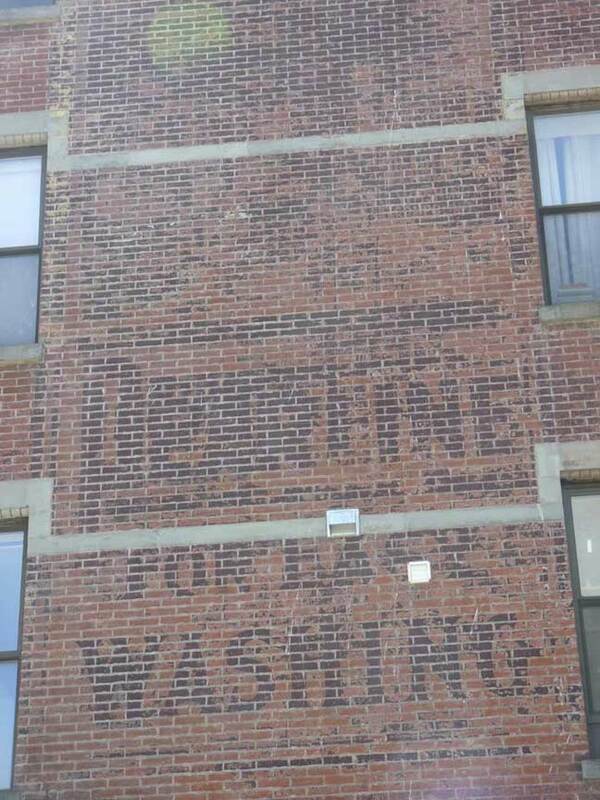 Pearline Soap was heavily advertised; Google has a gallery of Pearline ads. To the matter at hand, Metropolitan Avenue beginning at the East River. 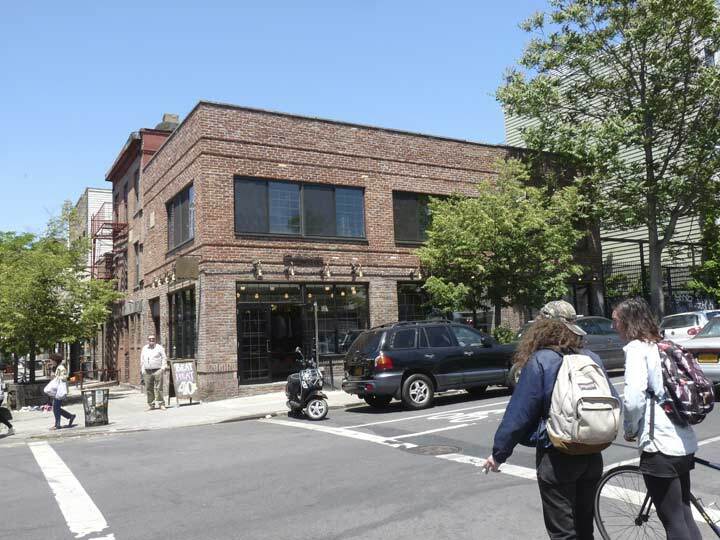 The first cross street it encounters is River Street, a bit of a curio that runs for 3 blocks from Grand Street to North 3rd between Kent Avenue and the East River. If you check the older maps above, it used to issue from Kent Avenue between South Second and 3rd, then take a curve and then assume its present path. 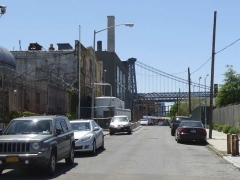 There are no longer any addresses fronting River Street, but looking south, it affords a view of the Williamsburg Bridge and looking north, a look at the Austin Nichols Warehouse. The Austin Nichols Company, established as a wholesale grocery business in 1879 by by James E. Nichols and five former associates of Fitts & Austin, eventually became a world leader in comestibles distribution. 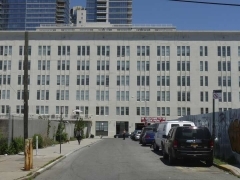 In 1915, architect Cass Gilbert, perhaps better known for the “Cathedral of Commerce” Woolworth Building, designed this rather spare, 179×440-foot plant. By the 1950s it was a mixed-use building and had become rundown until it was revived in the mid-2000s as a residential complex. 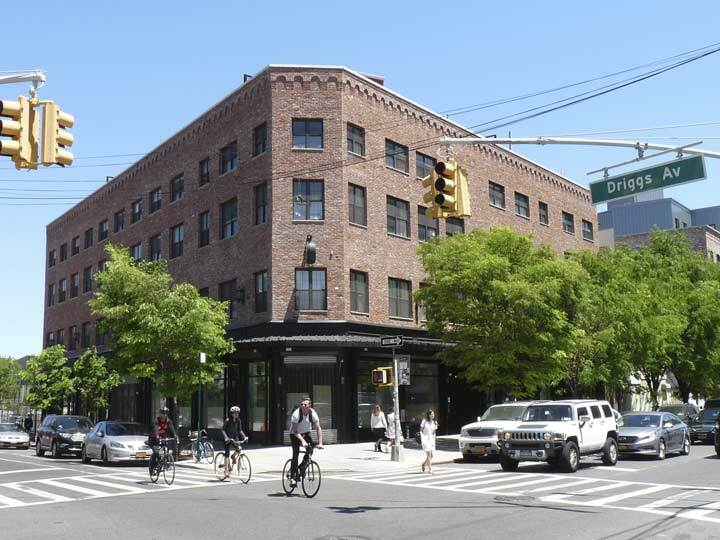 Like many major NYC thoroughfares, Metropolitan Avenue has humble beginnings. 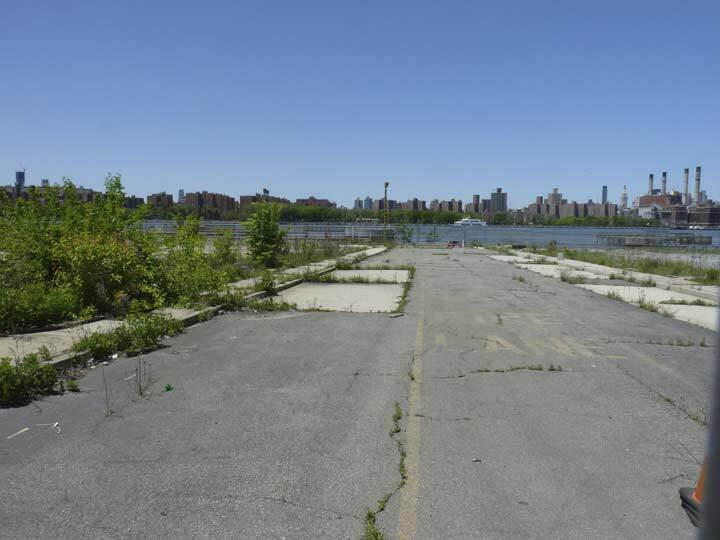 In 2015 it was an abandoned pier jutting into the East River, albeit with a marvelous view of the Manhattan skyline. No doubt developers are slavering to build tall apartment buildings here to take advantage of the view. 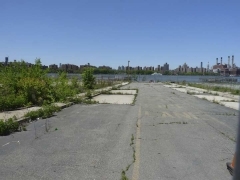 You hope that anyone who develops here will follow the lead of the Austin Nichols or Schaefer Landing builders — who constructed walkways open to the public so everyone can enjoy that view. Finally time to begin an 8-mile walk east on Metropolitan Avenue. What will I find down there? 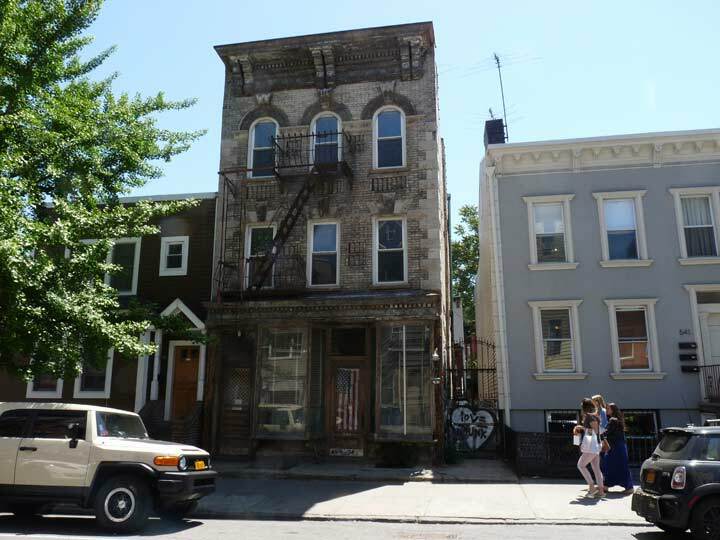 A pair of residences, likely going back to the mid-1800s, on Met Ave. between Kent and Wythe. Note the star-shaped iron pieces — they are no mere decorations, but are the ends of tie rods that help support the walls. Another piece of the past, at one time a storefront; the proprietor likely lived upstairs, which still has a trio of very old casement windows. 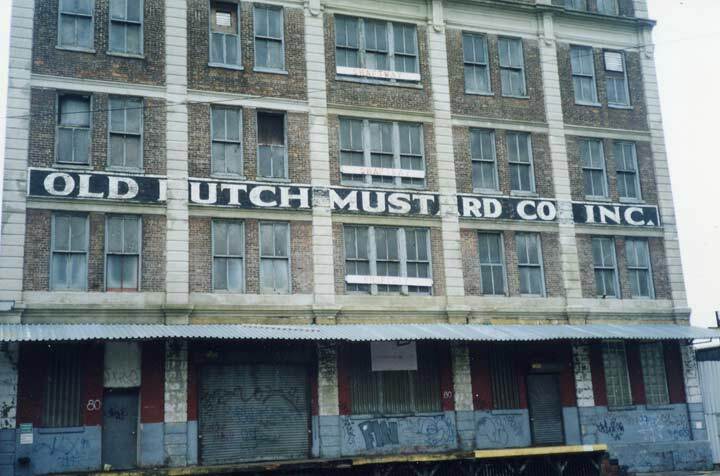 When I first started FNY, I marveled at the Old Dutch Mustard building at #80 Metropolitan Avenue at Wythe. 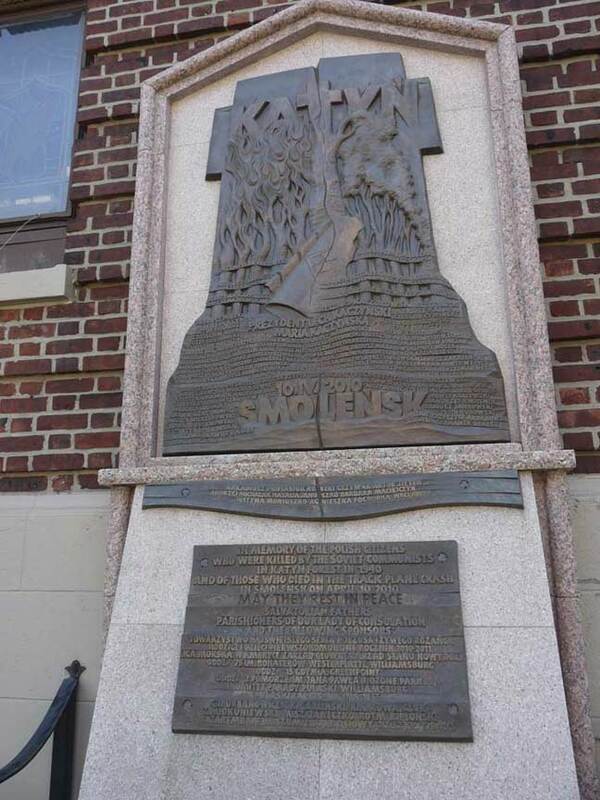 The company was founded in 1920 by Czech immigrants Vladimir K. and Elsie Kedrovich and moved to this building about 1940. In the 1980s the company moved to Great Neck, NY and later, Greenville, New Hampshire. 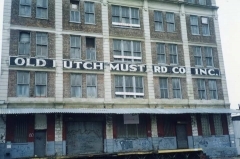 The building was demolished in the fall of 2006. 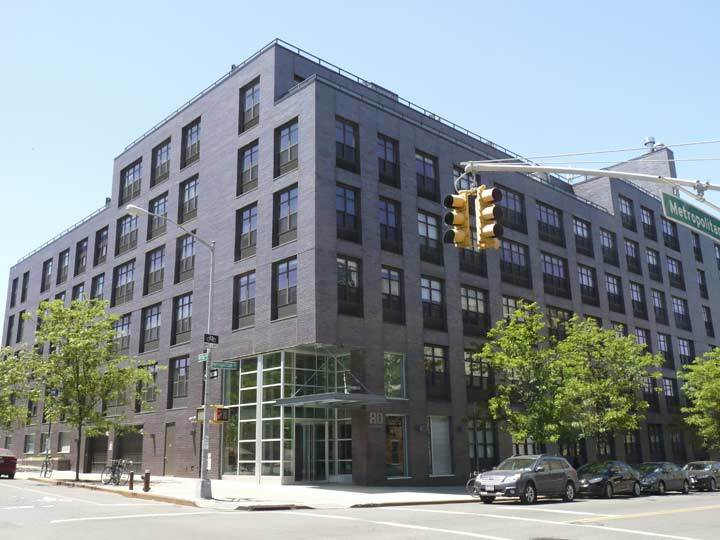 The new #80 Metropolitan Avenue counts a swimming pool for residents among its perquisites. 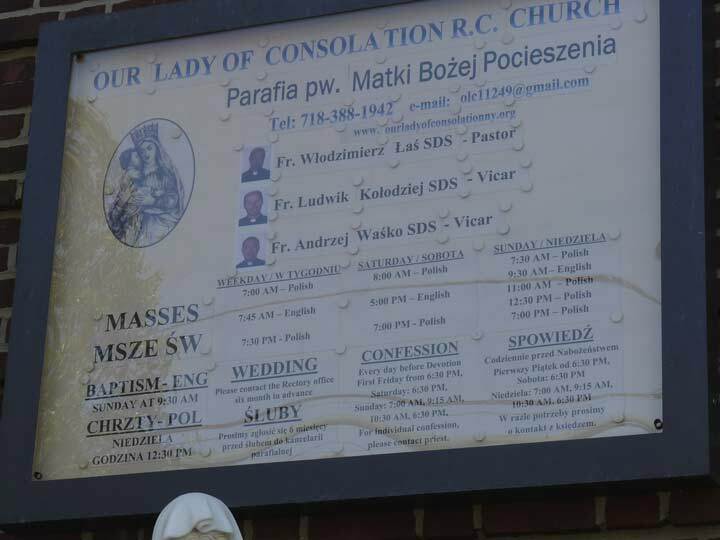 Our Lady of Consolation Roman Catholic Church, 184 Met Ave. between Berry Street and Bedford Avenue, is a reminder that Williamsburg, in addition to Greenpoint, used to be a Polish and Eastern European neighborhood and there are more than a few residents still there. Like most parish websites, www.ourladyofconsolationny.org/ vouchsafes no information on the building history or when the parish was founded, and the internet cupboard is bare as well. The building does appear to be about a century old. 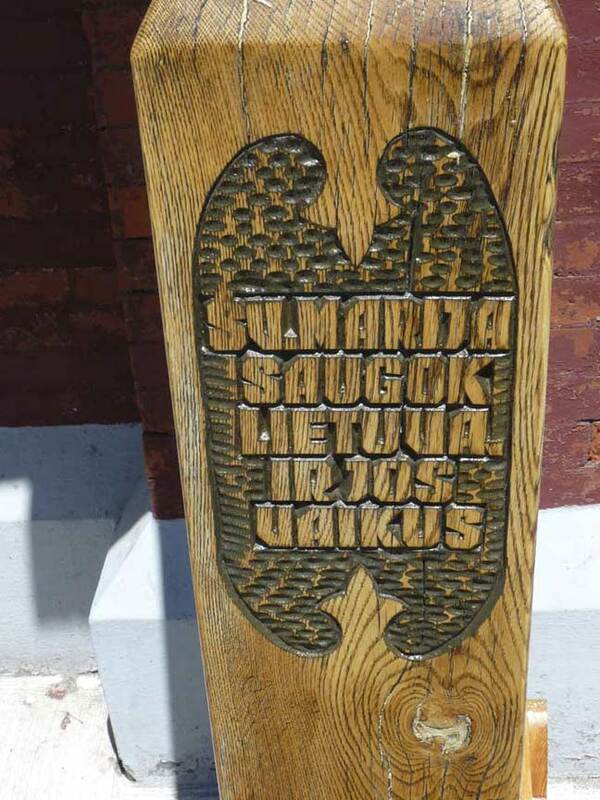 A memorial outside the church remembers two past disasters: the mass executions of 22,000 Polish nationals carried out by the Soviet secret police in 1940 after The Nazis and Soviet Russia divided Poland in the early days of World War II, and the plane crash of a Polish Air Force jet on April 10, 2010 at Smolensk, Russia that claimed 96 lives, including Polish president Lech Kaczyński. Metropolitan Pool, in the Metropolitan Recreation Center, has been on Met Ave. at Bedford Avenue since 1922 and was designed by architect Henry Bacon, whose other works include the Lincoln Memorial in Washington, DC and the small lampposts that appear by the thousands in NYC parks. 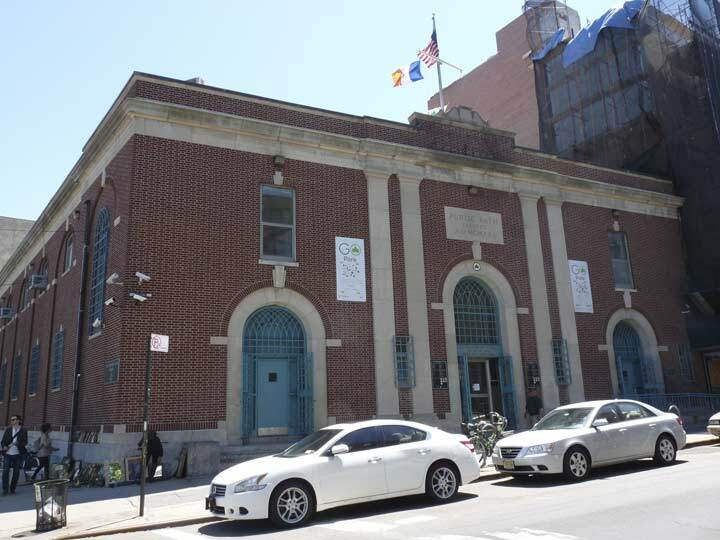 It was one of nine public baths built by the Department of Public Works in an era when every apartment didn’t yet have running water. 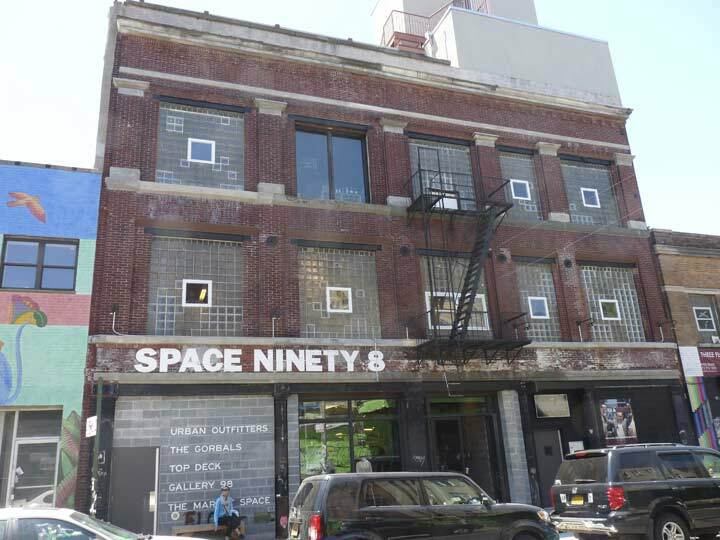 Sweatshop, at #238 Met Ave. where it meets North 3rd Street, is one place that knows itself. It boasts another shingle sign in a genre I’m becoming quite fond of. OK, I’m not a coffee drinker and had to look up the lingo. A “flat white” is an Australian beverage prepared by pouring microfoam (steamed milk consisting of small, fine bubbles with a glossy or velvety consistency) over a single or double shot of espresso, according to wikipedia. 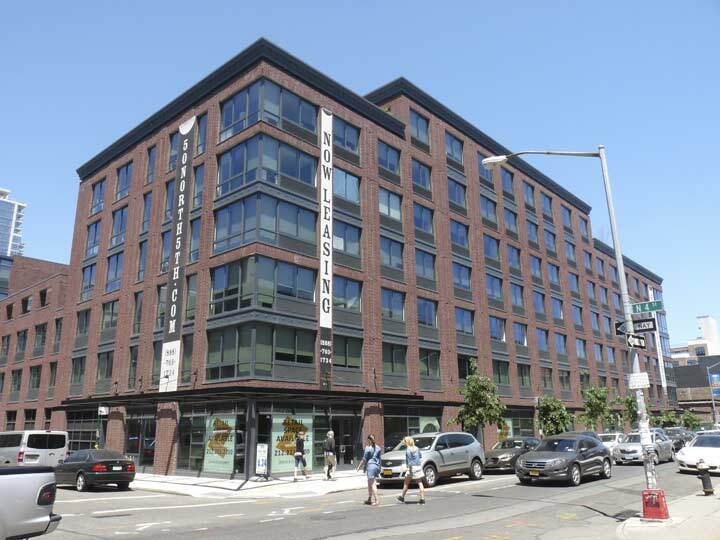 265 Metropolitan Avenue at Driggs is a recently remodeled brick loft building. 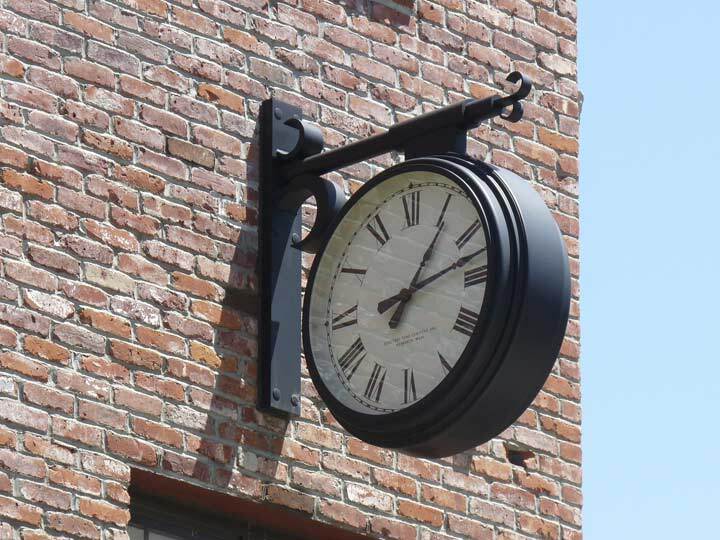 Notable for the little brick arches at the roofline, chamfered edge on the corner, and new clock that at least in May 2015 was telling the correct time. 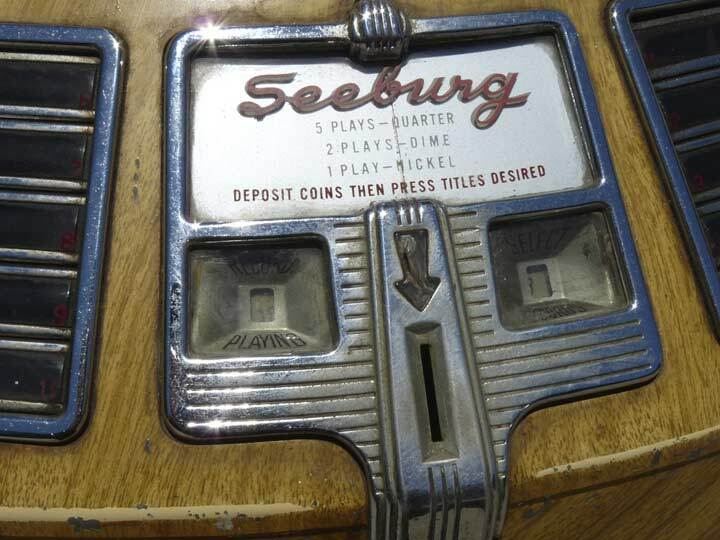 Continuing along Met Ave., a place called Eclectic Collectibles and Antiques was offering a classic Seeburg “trashcan” jukebox, likely produced in the late 1940s. Ebay searches had these items selling for between $1500 and $2000 but I’ve seen as high as $4,000. The company was founded by Swedish immigrant Justus P. Sjöberg in the early 1900s. I’ve always been a jukebox fan even down to the graphics — I like the little arrowed signs identifying the songs with the A sides and B sides. You could always choose to hear the little-known B-sides that WABC or WMCA wouldn’t play. 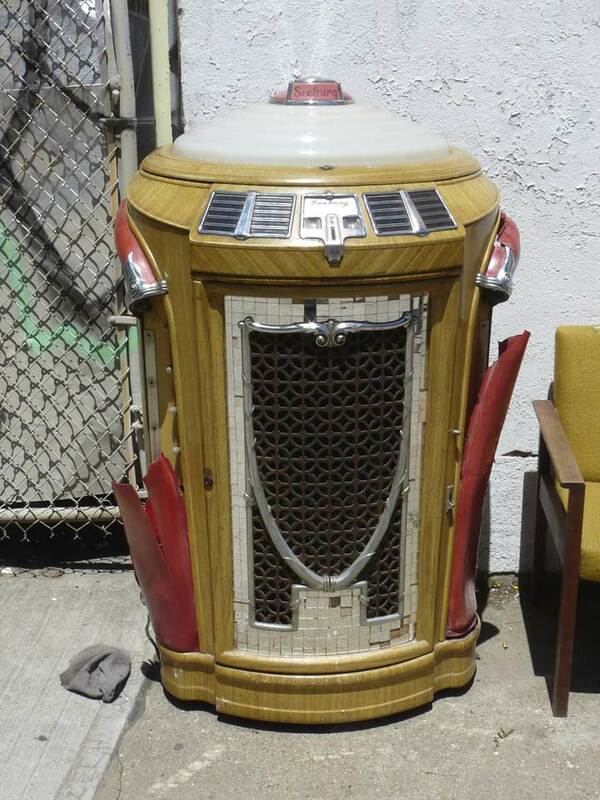 The closest jukebox to my home I know about now are the smaller ones installed in every booth at the Great Bay Diner, how Jackson Hole, on Bell Boulevard and 35th Avenue. 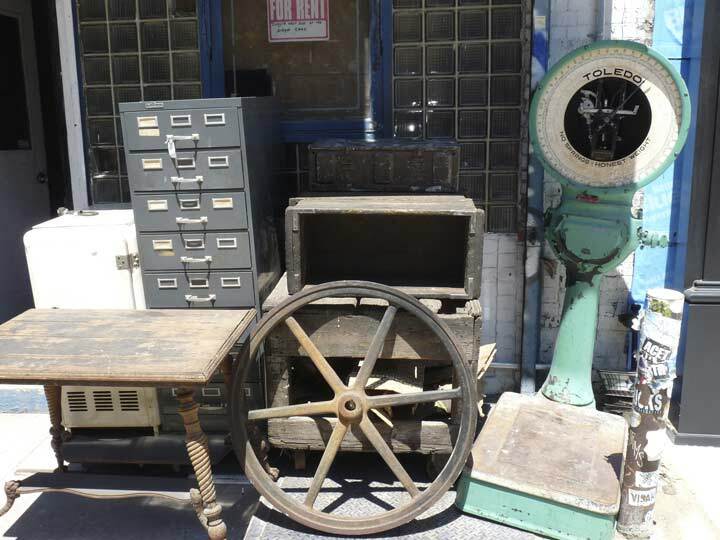 More magnificent junk, including a classic Toledo dial scale. The company was founded in 1901 by Henry Theobald, who purchased an automatic computing pendulum scale invented by Allen DeVilbiss, Jr., who was born in Toledo, Ohio. After a series of mergers, the scale manufacturer was known as Mettler Toledo in 1992 and today continues its mission of producing precision weighing and measurement instruments. 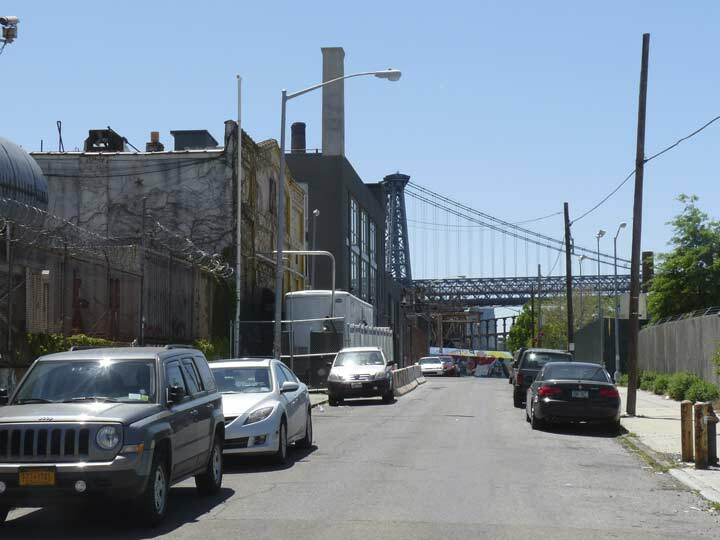 Yet another huge brick factory, this one at Met Ave. and Roebling Street, named for the father-and-son architects of the Brooklyn Bridge, John and Washington Roebling. The ground floor is a used furniture shop. I like that metal walkway on the Metropolitan side. 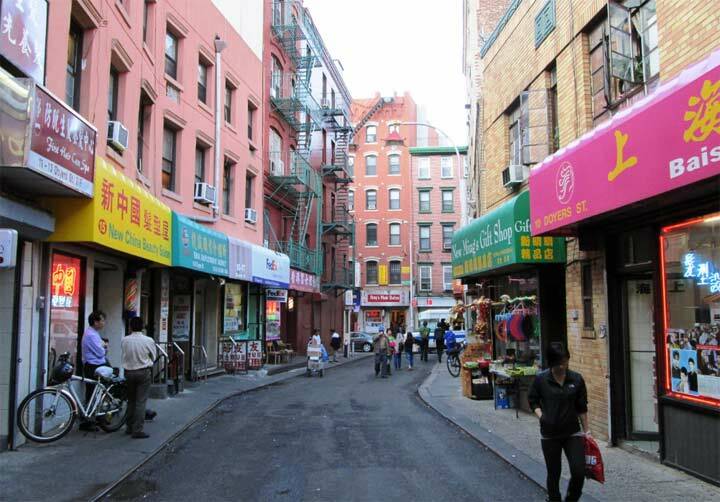 Ascenzi Square is the triangle formed by Met Ave., Roebling Street and N. 4th Street. 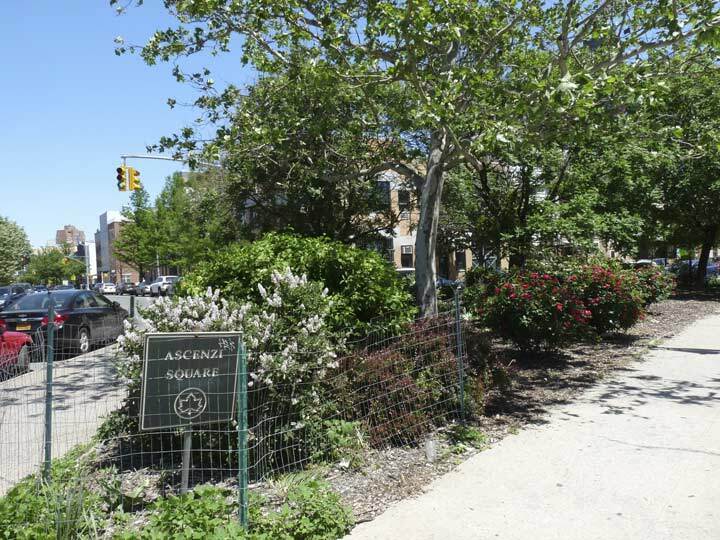 The square was named for two of four Ascenzi brothers, Williamsburg locals who fought in WWI. Of the four, Joseph and William were killed in action. 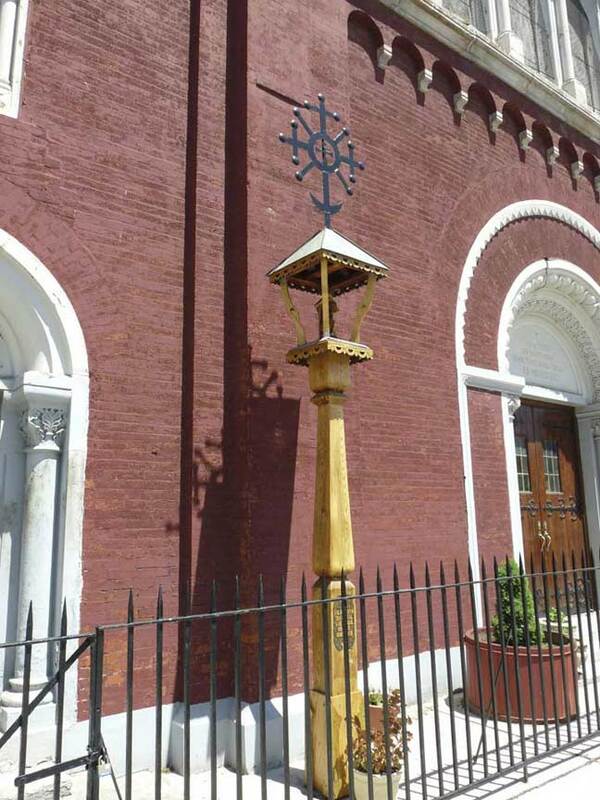 Marion Duckworth Smith, the owner of NY State’s oldest residence, the Lent-Riker house in northern Queens, is a relative of the brothers and is curating a memorial to them in late 2015-early 2016 at the nearby City Reliquary (see below). 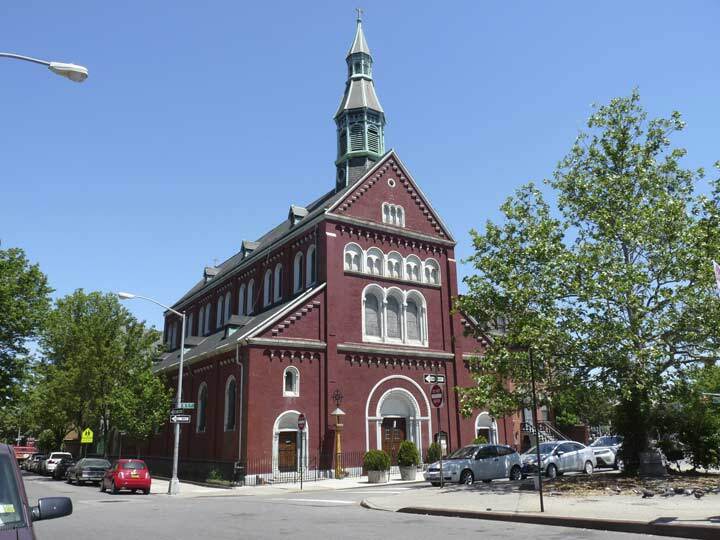 St. Anselm in Bay Ridge was my parish church (named for a 12th-Century British monk/theologian/philosopher) growing up. 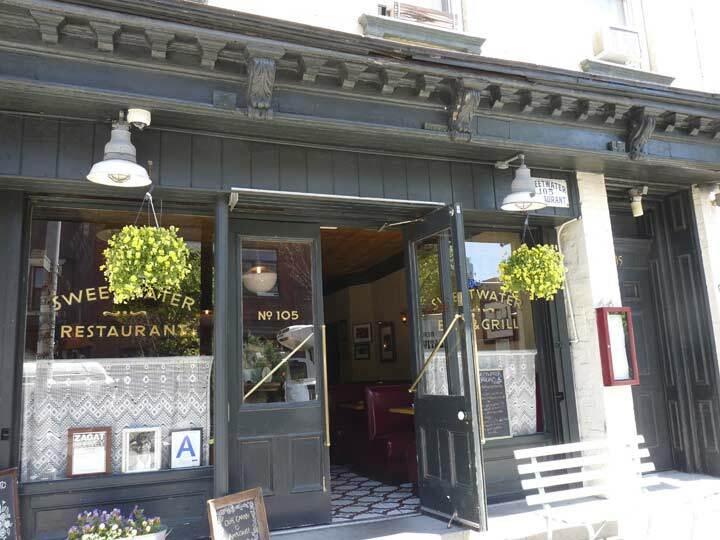 It is also a steakhouse at #355 Met Ave. at Havemeyer Street. I haven’t been in, but the exposed brick walls and wood tables is a decor scheme that always attracts me. No idea if owner Joe Carroll was from Bay Ridge or why he chose the name. 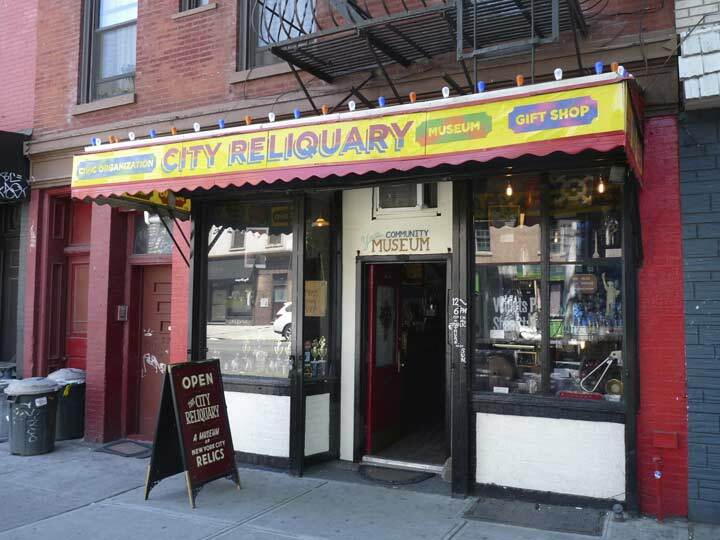 The City Reliquary at #370 Metropolitan, is a unique museum founded by NYC firefighter Dave Herman in 2004. I visited soon after its original incarnation opened in a Grand Street storefront in 2004 (see my FNY page). The museum found a storefront on Met Ave. a couple of years later, and in one of my greatest coups, I was able to mount an exhibition here on New York City lampposts with photographer Bob Mulero in the summer of 2010. 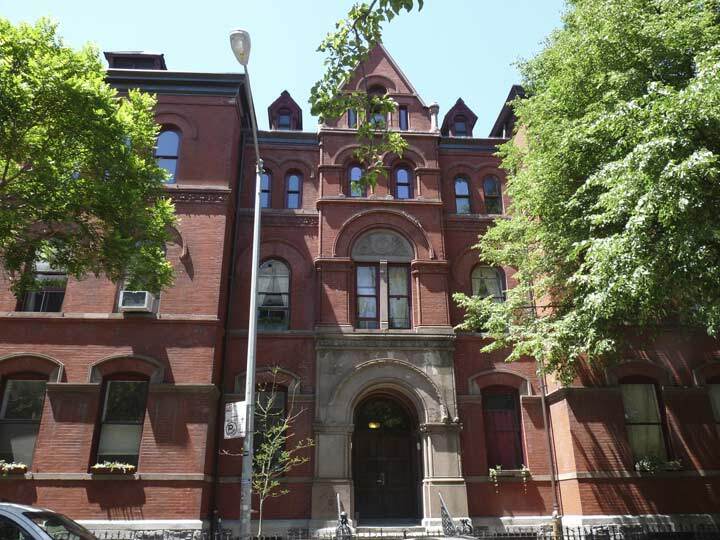 This is Berlenbach’s school building, also one of my favorite buildings in Brooklyn if not NYC. The carven Latin inscription means “Roman Catholic School of the Church of the Annunciation of the Blessed Virgin Mary.” It’s no longer the parish school; now it is a community center and the Northside Neighborhood School. 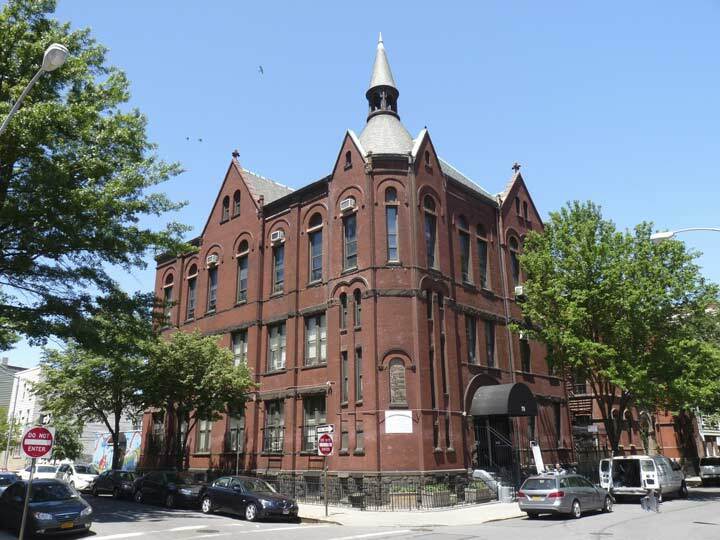 Berlenbach’s convent building on Havemeyer Street once housed the Sisters of Saint Dominic. It became co-op apartments in 1984. The marble spaces above the church doorways have more gilded inscriptions in Latin. The church has been stewarded well over its over 145-year history. 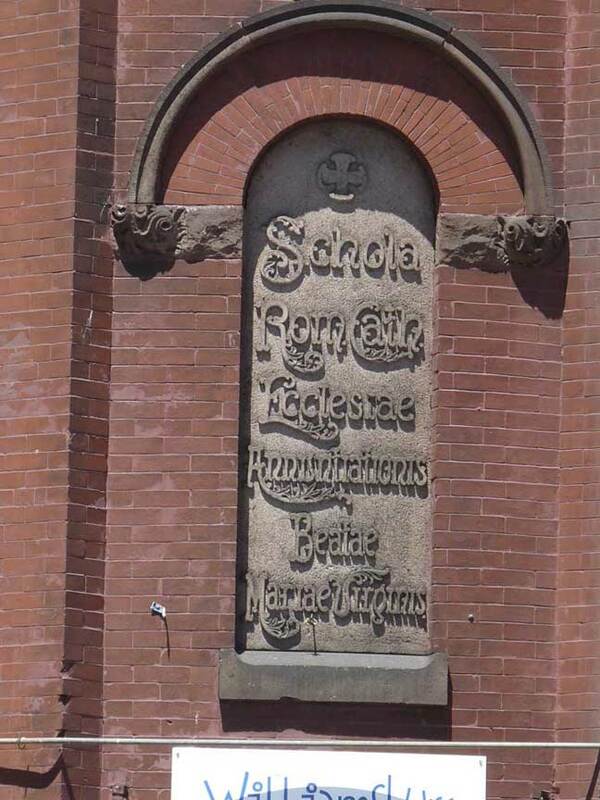 Williamsburg should look with pride at this church-school combo. “Annunciation” refers to the New Testament story of the visit by the archangel Gabriel to inform Mary that she was “immaculately” conceived of God, without a physical sexual act, and she was now expecting to deliver Jesus, the Son of God, in 9 months. 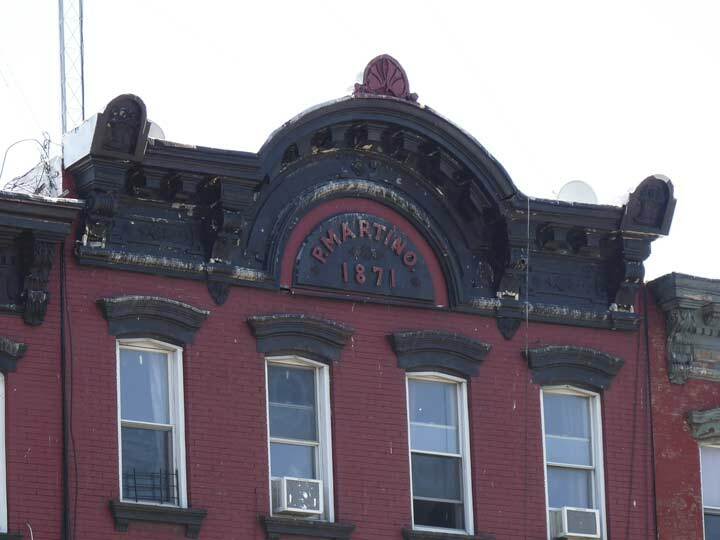 The apartment building on the east side of Met Ave. facing Havemeyer was built in the same era as the church, in 1871, as the pediment proves. 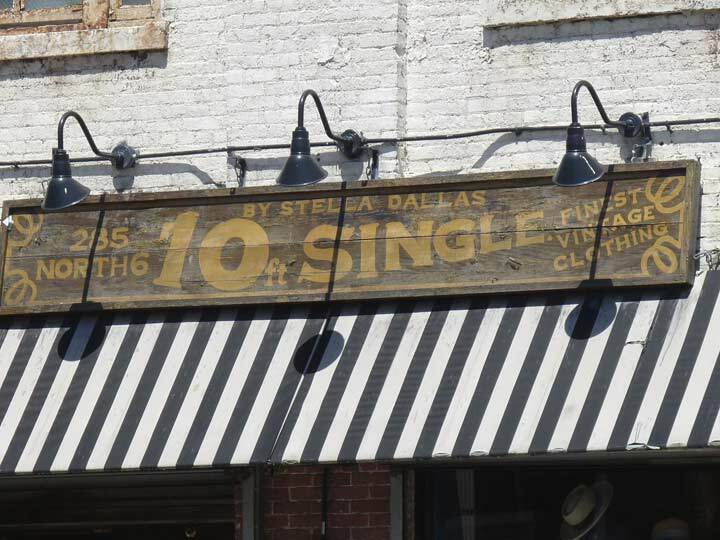 Another tall (5-story) loft building on North 6 just as it intersects with Met Ave. has another deliberately aged sign in the Copperplate font for a vintage clothing site. The Stella Dallas in the title was a striving mother played by Barbara Stanwyck in 1937 movie based on a novel. 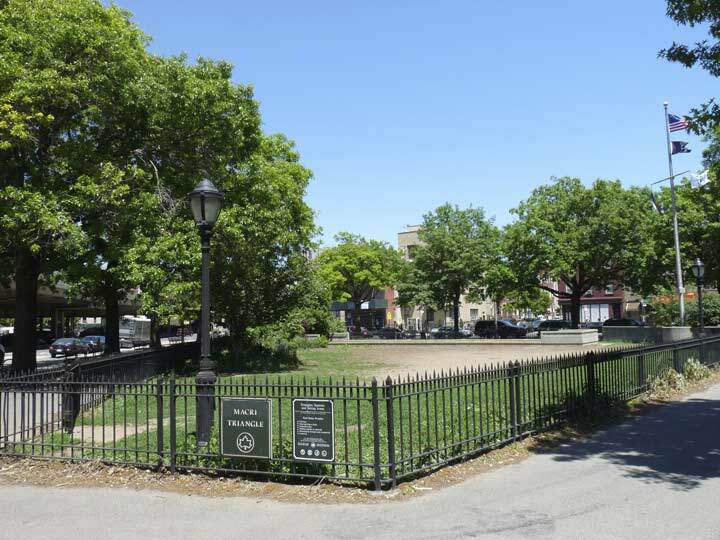 Macri Triangle, formed by Metropolitan, Meeker and Union Avenues, is one of Williamsburg/Greenpoint’s larger green spaces, after McCarren Park, McGolrick Park and the new parks facing the East River. The triangle features a World War II memorial, and the Macri for whom the triangle is named may or may not be on the tablet; otherwise, NYC Parks is silent about Macri’s identity. 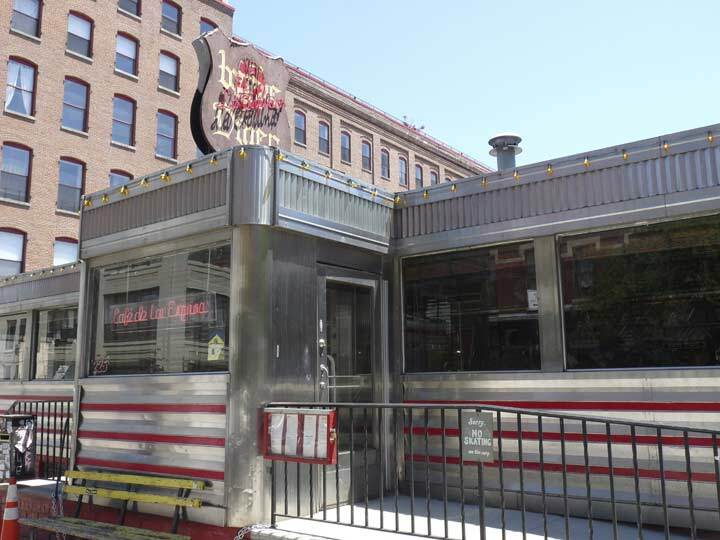 Kellogg’s Diner, SE corner of Met Ave. and Union Avenue, has the usual voluminous menu most diners have. During the past decade it was completely renovated. 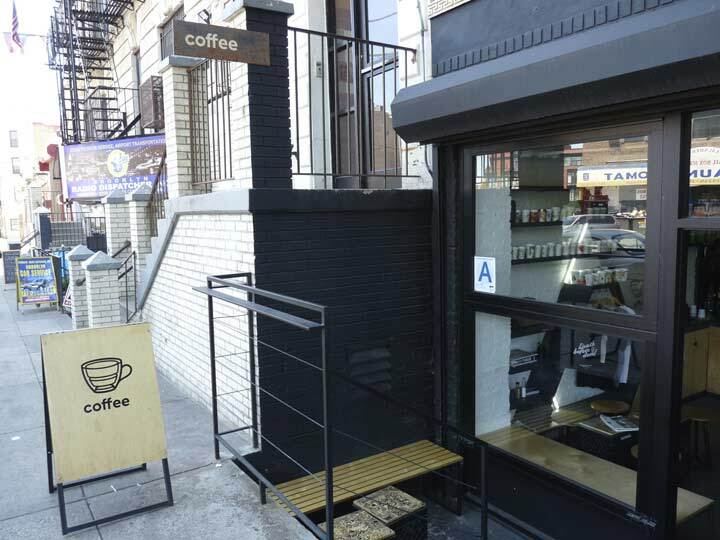 New York Magazine reported that the entrance was once through a convenience store, but I don’t remember that at all. I imagine a full range of Kellogg’s Cereals are on the breakfast menu. If your desires include something other than comestibles, Met and Union has something for you there, was well. 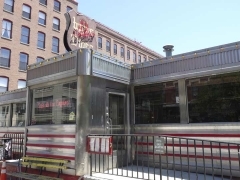 There is a Two Boots restaurant in downtown Bridgeport, Conn.
Hi, My name is Ronnie and I’m from Williamsburg and went to elementary school at Our Lady of Mount Carmel then St. Francis of Paola after OLMC closed down in the 80’s. My Mom still lives there and I visit her often and can’t believe how much the neighborhood has changed over the years. The reason why I’m writing you is because of the Kellogg’s dinner. In the late 80’s a gasoline truck exploded outside the diner killing a few people and sent shock waves through the neighborhood. The only mention of it I could find is in the link below after another incident happened there. I thought you might find it interesting. I moved out of the area in 2004 but have many memories growing up and would be happy to answer any questions you may have. 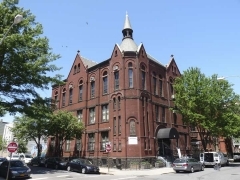 An old parishioner told me that Our Lady of Consolation was built in its configuration resembling an apartment house because it was designed as a multi-use building – one if the first of its kind – with the church on lower floor(s), and a Catholic School above occupying the upper floors. 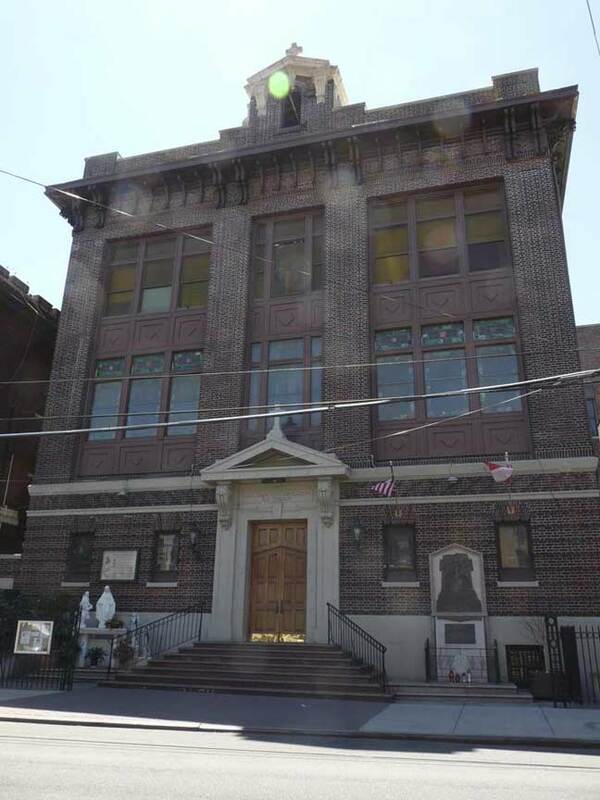 As you go further east on Metropolitan, you will run into a similar church/school building. 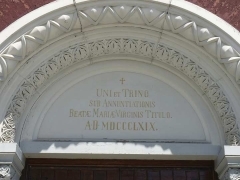 It is St Margaret’s RC Church and School on 80th Street, just north of Metropolitan in Middle Village. The Publix Grocery store chain has big Toledo scales in nearly all its stores so you can weigh yourself but theyre not made in the US anymore. An older relative of mine has spoken about leaving Lithuanian mass and heading to the bar across the way — I always wonder if that bar is what became the Commodore. 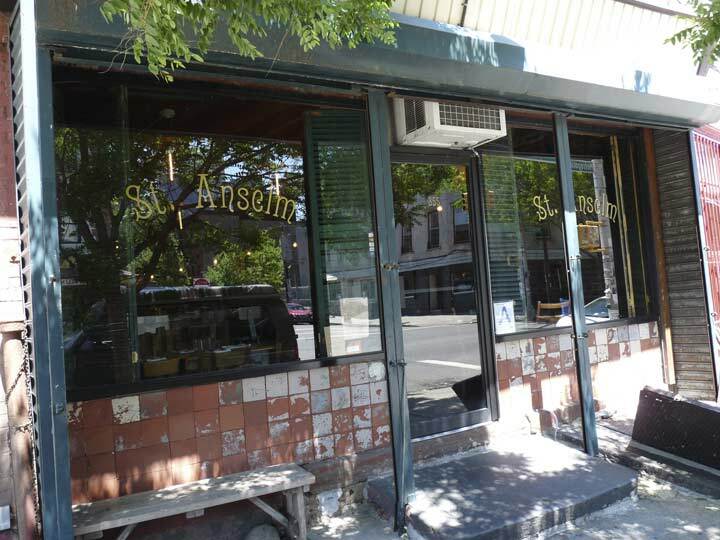 The bar directly across from the Annunciation church was located at 386 Metropolitan Avenue. My grandparents lived in one of the upstairs apartments from the 1930’s through 1974. The bar was initially called “Frank’s Bar” in the 1950s – 1960s, but growing up in the late 1960s – early 1970s, I knew it as “Eddie’s Place.” The proprietor was a great guy named Eddie Fudginski (spelling?). Eddie’s place closed in the early 1970s and to the best of my knowledge, has remained vacant to this day. The Commodore, located down the street a bit, was known as the “Hi-Way Lounge” from the 1960s – 1980s, and was a big-time Mafioso hang-out (think “A Bronx Tale). 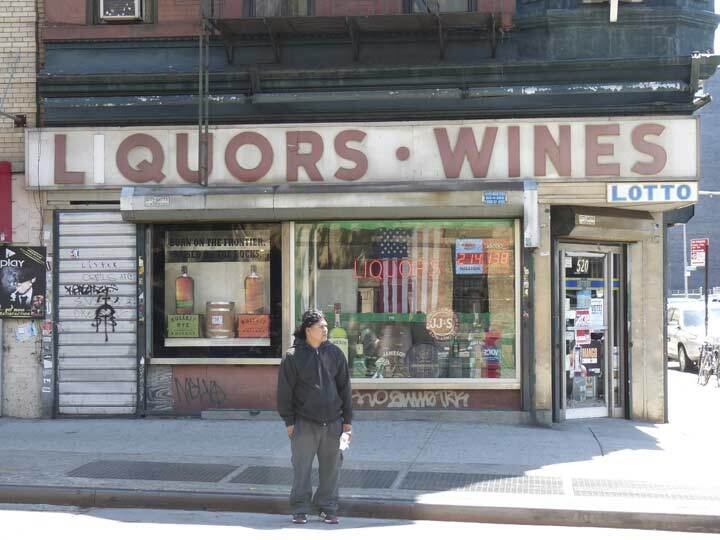 In looking at the photo of the Liquor store on the corner of Metropolitan Avenue & Union Avenue, I suddenly realized that he subway entrance (on the Metropolitan Avenue side – just outside the liquor store’s window) is gone. I checked Google maps, which goes back to 2007, and it’s not found in that photo either. There doesn’t seem to be any trace (at least above ground) that it ever existed. 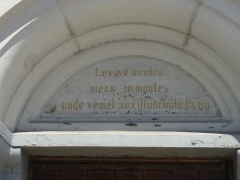 Does anyone know when this subway entrance was sealed? On a separate note, that liquor store was owned and run by a guy named “Charlie” in the 1970s.